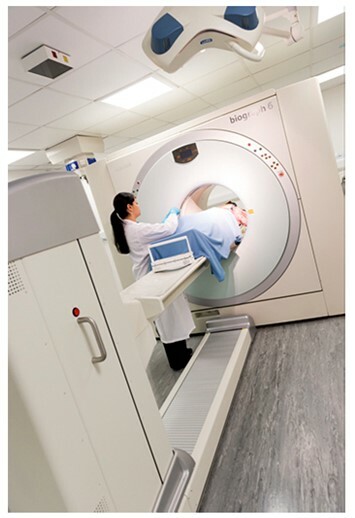 Imperial College ECMC‘s main objectives are to develop novel imaging, biomarker and therapeutic approaches that will aid cancer diagnosis and deliver personalised treatment. One area we focus on is understanding and overcoming drug resistance in breast and ovarian cancers which has led to novel treatment strategies and evaluation of a range of biomarkers that help support therapeutic decisions. 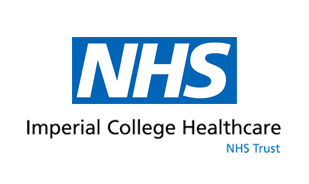 Our ECMC centre has close alignment with the CRUK Imperial Centre, the Imperial NIHR Biomedical Research Centre and the Imperial College Academic Health Science Centre. At Imperial, our cancer research is harnessed with forefront expertise in Physics, Chemistry and Engineering. This is exemplified by synthesis of series of novel PET Imaging probes that have been taken from laboratory to bedside and are now being used for cancer diagnosis and response assessment. More recently, the Intelligent Knife (iKnife) device has been developed which during surgery, identifies tumour cells based on their biological characteristics and therefore enables surgeons to more efficiently remove traces of tumours. Professor Michael Seckl is an Honorary Consultant in Medical Oncology at Imperial College NHS Healthcare Trust and Chair in Molecular Oncology in the Department of Surgery and Cancer within the Faculty of Medicine at Imperial College. He runs both clinical and translational laboratory science. In collaboration with Professor Robert (Bob) Brown, Professor Seckl co-leads the Imperial Experimental Cancer Medicine Centre (ECMC), which focuses on reversing resistance to cancer utilising our strengths in breast, ovarian and colorectal cancers, imaging, epigenetics, phenomics/metabonomics, engineering and surgical technologies including the i-knife. As part of the joint steering committee for the ECMC Combinations Alliance, Professor Seckl oversees the delivery of studies throughout the ECMC network. He encourages the collaboration of all ECMC centres and the development of safe and innovative protocols, with the principal aim of brining benefit to cancer patients faster. Eric Aboagye is Professor of Cancer Imaging and Director of the Cancer Imaging Centre at Imperial College London. He has been responsible for the discovery and validation of Molecular Imaging methodologies designed to help clinicians understand the biology of cancer in vivo. In the past 5 years, the team has invented and translated three novel cancer diagnostics into human application. Dr Laura Kenny has a particular interest in predictive biomarkers for novel therapeutic agents, and has been Chief Investigator for several first in man studies of molecular probes for use in molecular imaging by positron emission tomography. The Early Phase Cancer Trials unit offers trials in across all solid tumour types. The Clinical Research Facility in Imperial has state of the art facilities for Phase 1/11 trials, and has a portfolio of research council/pharmaceutical sponsored/academic studies. Imperial ECMC has developed a new method for identifying whether a tumour has programmed itself to die. This will allow cancer doctors to know very early whether they should continue or modify treatment with particular drugs or drug combinations. The Imperial group used their patented method for detecting a protein called caspase-3 which is converted to an active state when tumours decide to ‘commit suicide’. The test involves injecting a compound called 18F-ICMT11 through the veins and imaging the patient non-invasively within a scanner by a technique called positron emission tomography. 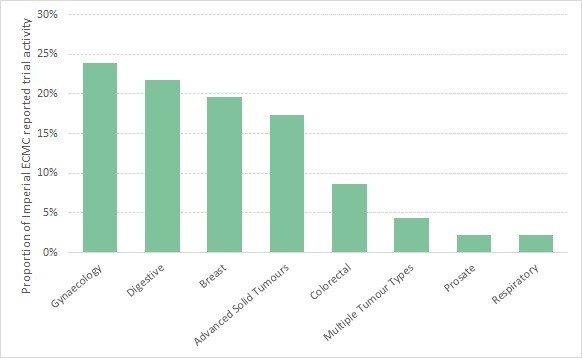 After circulating through the body, 18F-ICMT11 binds to active caspase-3 and concentrates in tissues including tumours that have the active protein. The lead ECMC scientist, Professor Eric Aboagye, indicates that this is a great example of team work and of translating our knowledge of cancer biology and chemistry into clinical reality. This method will allow response to be assessed in days to weeks rather than months as is the case now, and could therefore be used to optimize patient treatments. Following initial preclinical testing, the technology was tested in healthy volunteers to find out the normal physiologic distribution and also whether the test was safe. After demonstrating safety the team led by Oncologist Dr Laura Kenny is now studying this test in multiple clinical trials in patients with breast and lung cancer, and lymphoma undergoing treatment with chemotherapy. Future studies by the team will examine use of this method for detecting response in patients undergoing treatment with new cancer treatments including immunotherapy. ECMC funding provides infrastructure support for early phase and translational research. From the ECMC London Imperial portfolio, the following trials have been carried out.